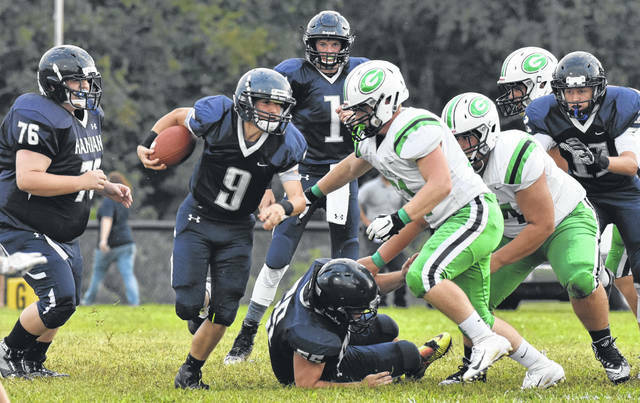 HHS junior Christopher Exline (9) carries the ball during the first quarter of the Wildcats’ 86-14 setback against Green on Friday night in Ashton, W.Va.
ASHTON, W.Va. — A lesson in resilience. 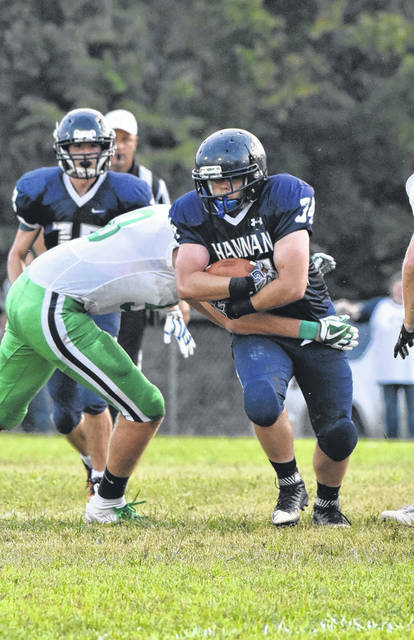 The Hannan football team put together a rousing performance in the third quarter, but visiting Green simply had built too wide of a margin to overcome in the first half on Friday night as the Bobcats pounced early en route to a 86-14 victory during a Week 2 non-conference matchup at the Craigo Athletic Complex in Mason County. The Bobcats (2-0) leaped to 40-0 advantage in the opening period, while the Wildcats (0-2) failed to gain a first down on each of their four drives of the quarter. HHS continued to struggle in the second quarter, as Green manufactured a pair of scoring drives that resulted in two Alec Smith touchdown runs, extending the margin to 54-0 at intermission. The Bobcats tacked on their eighth touchdown of the contest 3:13 seconds into the second half, but Hannan answered the visitor’s 62-0 scoring run, with its first points of both the contest and the 2018 campaign. HHS senior Matthew Qualls ended the Wildcats scoring woes, at the 7:58 mark of the third period, as he connected on a 43-yard touchdown pass to Dominic Burris. Hannan’s attempt at a two-point conversion was unsuccessful, narrowing the margin to 62-6. Trailing 70-6 with 5:45 remaining in the third quarter, HHS junior Jordan Fitzwater capped off a five play, 59-yard drive with a 17-yard run. Qualls followed by connecting on a pass with Andrew Gillispie for the two-point conversion to cut the lead to 70-14. Green closed the third period with a pair of touchdowns, the first coming on offense when Lonnie Smith scampered for a 35-yard score with 5:11 remaining in the quarter. The Bobcats final touchdown of the contest came by way of their defensive effort, as Gage Sampson intercepted Qualls and returned the ball 53 yards to propel GHS to a 86-14 advantage. Hannan and Green were both held scoreless in the finale, as the Bobcats closed out the 62-point victory. All three of the game’s turnovers were committed by the hosts, as the Wildcats lost one fumble and threw two interceptions. HHS committed four penalties for 35 yards, while GHS was flagged for 12 penalties for a total of 75 yards. Qualls finished with a 6-of-18 passing performance for 102 yards, throwing two picks and one touchdown. Three different Hannan players caught at least one pass in the setback, with Burris leading the way with two grabs for 66 yards. Andrew Gillispie hauled in three for nine yards, while Gage Burris had one catch for 27 yards. Fitzwater paced the Wildcats’ rushing effort with five carries of 18 yards, while Burris and Stephen Berry each finished with two carries for eight yards, respectively. Following the contest, HHS head coach Kellie Thomas reflected on her team’s performance — particularly their resilience despite the wide margin early in the contest. “We ended the game with 12 players,” Thomas said. “The officials asked me if I wanted to cut the game short at halftime and I asked the boys and they said they weren’t quitting. They haven’t quit on me and I’m not going to quit on them. They have yet to give up. From here on out we will play four quarters. Next up for Hannan is a road date with Manchester on Friday.